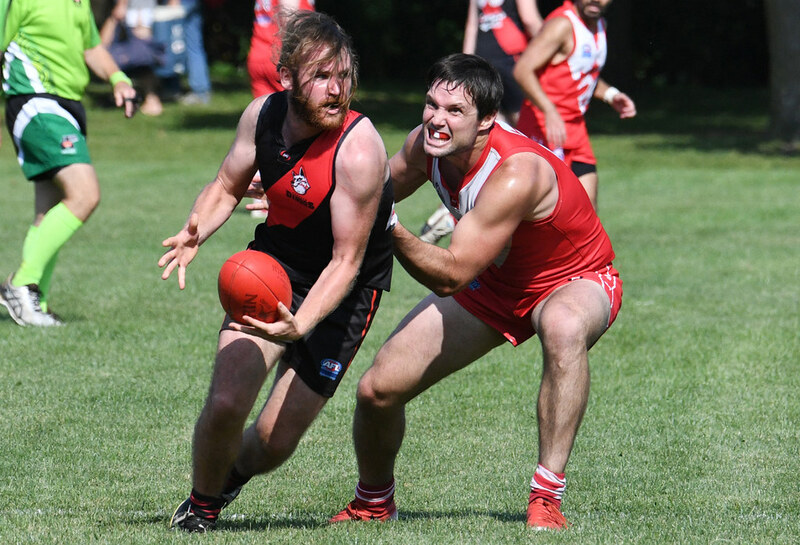 In the final round of the AFL Ontario regular season the Toronto Dingos found themselves facing the visiting Ottawa Swans. 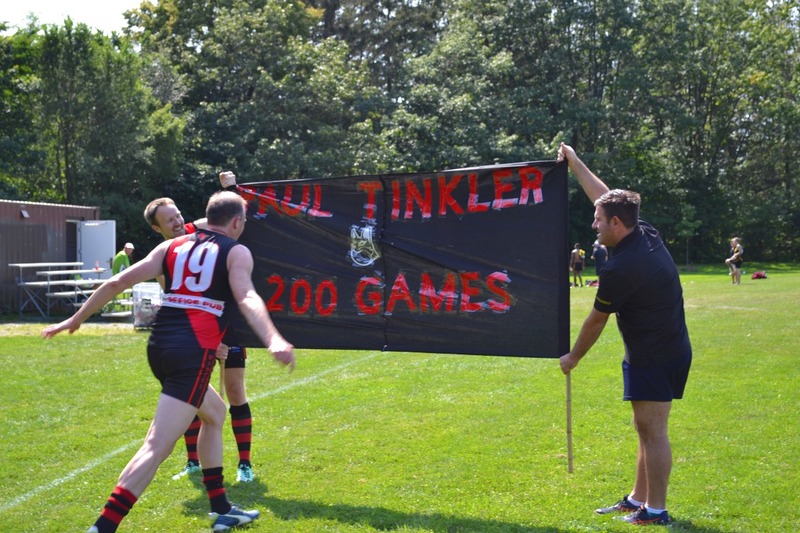 While the Dingos were already out of the race for a finals spot, they still had a lot to play for as they celebrated founding member Paul Tinkler’s 200th game with the club. Before the game “Tinks” and the team ran through a banner created to mark the milestone cheered on by supporters, past players, friends and family. Afterwards, however, it was time to focus on the match against perennial top-side Ottawa who were looking to maintain positive momentum going into their finals’ run. . In the first half, the Dingos were quickly able to establish themselves as a credible threat, with team “spirit animal” Steven Speers again excellent in the middle and Greg Gilbert, playing for the first time in the ‘guts’, doing plenty around the contest. Rob McNaughton as always provided a strong target up front with support from Michael Ladd coming off the half-forward line to clean up the crumbs. The Swans also spent some time with a short bench due to a yellow card, with Dingos ruckman Stephen Gordon capitalizing on the resulting free kick right in front. All told the Dingos were able to head into half-time with a lead and some wind in the sails having surprised the visitors out of the gate. Things continued in much the same fashion early in the third quarter when Dingos veteran David Wells who had been a stabilizing force in the half-back line landed awkwardly and had to be helped off the ground. After the short break that ensued, Ottawa started to turn the tide, piling on a couple of quick goals to leave the Dingos in a hole entering the final term. With nothing to lose though the Dingos were able to fight back through hard work all around the ground and regain a slender lead late in the game. After a period of back and forth play in the end though it was the Swans who were able to break free and kick what would turn out to be a match sealing goal with limited time remaining. The Swans ultimately prevailed by a single point, 8.4-52 to 7.9-51 with the Dingos unable to get out of the middle to make another parry. Michael Ladd was named best on ground for another outstanding performance. However, the day belonged to Patrick Bossey who was named in the Canadian All Ontario Team and All Ontario Team later in the evening at the AFL Ontario League Awards’ Night. Thomas Santibinez-Espinoza was also honoured on the Canadian All Ontario Team for another great season. For his part veteran Paul Tinkler was no doubt disappointed not to be able to cap his 200th with a win, but did contribute a goal. After capping a tough year on the field with a heartbreaking loss, the Dingos know there will be plenty of work to do in the off-season. Here they again showed that they are capable of competing with one of the top ranked teams in the league in spurts but will need to work on consistent effort over four quarters of play. In the meantime the Dingos will now look forward to their 22nd Annual AFL Grand Final Party at The Office Pub on September 29th.